If you’ve served in the military, you’ve probably heard about the Montgomery GI Bill countless times. However, you may not know all the facts. There are many aspects you should learn about the perk that will help get your degree. It’s a lot easier than you think. What kind of aid is this? The GI Bill provides needed funding to go to college, so it isn’t like a traditional Financial Aid program offered to civilians. The GI Bill for college will still allow you to take federal funding for aid, but it won’t be as large as the average loans taken on by non-military personnel. However, you can still pay the federal aid money back with the funds your get from the GI Bill. Why does it say the GI Bill only offers 36 months of college tuition? Don’t panic and think you need to complete all your course requirements in just two and a half years. This is a term that doesn’t exactly mean what it says. Whenever you use the maximum amount allowed at one time the GI Bill counts that as a single month. This may be a complex concept, but discussing your options with Omni Financial can help clear up any confusion. How long can I wait before my benefits expire? There are two types of GI Bills, and when you served determines yours. 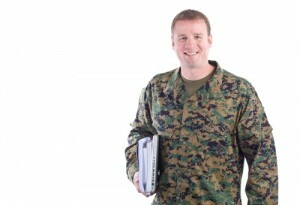 The Post-9/11 GI Bill is the most recent, and allows a person to use their benefits up to 15 years after they were discharged from the military, while the former one offers a 10-year grace period. What if I can’t go to school the whole time? If you have to take a semester off, need to go part-time or any other part of your schooling is interrupted, don’t worry. As long as you adhere to the 10- or 15-year window, you can complete your courses on your own time. There are plenty of ways the federal government can help you get through college, especially if you are having some financial difficulty. If you have any additional money questions or concerns, contact your local Omni Financial branch or read our financial tips and advice articles.